In the bitterly cold days before the Chinese New Year, bulldozers worked overtime on the site of last year's World Expo in Shanghai, tearing down all but five of the 54 giant pavilions that once cluttered the 1,305-acre (528 hectare) site on both banks of the Huangpu River that bisects the city. The demolition isn't an end but the beginning of a project far more ambitious than a mere World's Fair. 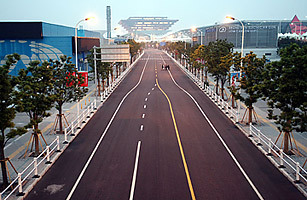 The Shanghai government trumpeted the "Better city, better life'' theme of the Expo far and wide. Now it has pledged to transform its chaotic sprawl into something more livable for its 19 million or so inhabitants within 10 years. The effort is more than propaganda. For at least five years, China's central government has tried, with mixed success, to impress upon the country's major cities that the growth-at-all-costs economic model, which has intensified environmental degradation nationwide, had to change. Now Shanghai, arguably the capital of that model, has embraced sustainability as the core of its next stage of development. The country, and the world, will be watching. The redevelopment of the Expo site could become the most visible symbol of one of modern China's most difficult problems: coping with the intensifying urbanization of the country. China already has 12 cities with a population above 5 million  more than any other country in the world. There are roughly 600 million urban residents in the nation today, a figure that will rise to 1 billion by 2030, according to a study by the McKinsey Global Institute. Making this transformation less chaotic and more environmentally sustainable is one of the critical goals laid out in Beijing's latest five-year plan. No wonder: many economists consider environmental degradation the biggest long-term risk to China's economic future. The vast Expo site creates a unique opportunity. One of the cardinal tenets of sustainable urban development is that density is a good thing. It generates economies of scale in public transportation, smart grids and other environmentally friendly infrastructure. Shanghai has for decades been a poster child for urban sprawl. The Expo site will bring development back to the city's center, linking both the older Puxi side of the city with Pudong, to the river's east. The Expo site was formerly an old industrial area that comprised 272 pollution-belching factories. What will replace it, by 2020, according to city planners, is an eco-friendly zone of parks, conference and convention centers and pedestrian-friendly retail and commercial space (which will help curb automobile pollution). Renewable energy  mainly wind and solar  will be the primary source of power. Mayor Han Zheng has already touted the development plan as a critical component of Shanghai's goal of reducing energy intensity (energy use per unit of GDP) 16% by 2015. All new construction will use eco-friendly materials, some recycled from the demolished pavilions. According to one of the architectural brains behind the plan, the goal of the effort is audaciously straightforward: "We have to invent our own model [of urban development]," says Yu Kongjian, who heads the Beijing-based urban-design firm Turenscape, given that no other nation faces these problems on the same scale. "As China's urbanization continues, the rate at which it consumes energy and water has to change." The alternative, Yu has said, "is that the environment fails, and the economy fails." Shanghai will be a test bed for the Chinese vision. A recent study by the Urban China Initiative  a joint research effort by McKinsey, Columbia University and Tsinghua University  found that Chinese cities that embraced sustainable growth actually grew their economies more quickly than those that, relatively speaking, ignored environmental issues. For cities like Shenyang, in the northeast, the keys to enhanced sustainability and growth are policies that have helped polluting industries migrate well beyond urban areas and encouraged careful redevelopment of brownfield sites using input from the private sector. That's the template Shanghai is following. All summer, the city boasted it would become China's pre-eminent symbol of sustainable growth. It has 10 years to turn that into reality.